Found in gardens all over the UK hedging plants are popular for a number of reasons and the most popular varieties are so for good reasons. The types that are hardy disease resistant and form a dense barrier are the widely used. Hedges have never really fallen out of fashion so if you are looking for a formal hedge, or an informal barrier we can help you can easily find the right variety. 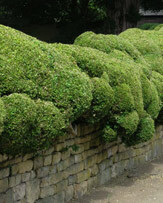 Even clipped hedges, can have an informal look, its all a matter of imagination and design ideas. 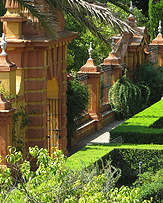 Hedges serve a number of purposes in the garden and in broader landscaping projects. They act as a design feature or ornamental plant, as a privacy or screening plant as well as a light, noise, wind or dust barrier. Position is also important, some plants will cope well with sun or shade, others may struggle in a shaded position, of suffer in full sun or coastal conditions. One of the biggest mistakes when planting a hedge is to choose the wrong plant for the conditions, although a plant may be 'all the fashion' at Chelsea, or 'on sale' at 'cheap prices' the question is, will it be the right choice for your situation and climate in the long term. Style is also important, are you looking for a formal style that will be pruned or clipped regularly, or an informal type that requires little maintenance. Considering buying mature or advanced plants, this can create an 'instant hedge' but will cost a lot more to buy than smaller plants. Hedging plants perform many tasks, they work as privacy screens, and also function as wind breaks. They can also be used as an informal fence. Box (buxus) and Laurel plants are two popular species in the UK. Hedges can also be used to extend the height of a garden wall, adding extra privacy as well as adding a little extra design detail to landscaping with hedges. The right plant for the right conditions and climate, this is a basic requirement with most plants. T he degree of maintenance including pruning and general care can be a determining factor when selecting the right hedging plant. The question of how many hedging plants per metre is not difficult is you know little about the growth habit of the selected plant. 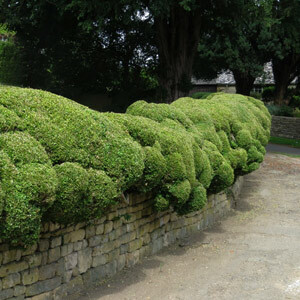 A general rule when establishing a dense hedge is to determine the usual width of the selected plant. 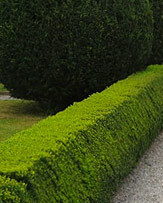 Hedging should be planted at around 1/2 the projected width. So a plant that has a growth width of 1m should be planted at .5m apart. Slower growing plants, or where a quicker establishment is required should be planted at around 1/3 the width. 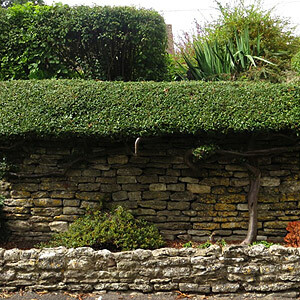 The clipped hedges that we see in many garden design books and indeed in many gardens throughout the country are known as formal hedges. The best type of plants for these are those that grow both on old wood and new, as this allows for better growth with constant pruning. Also smaller leafed varieties lend themselves more readily to this. As with all plants some are better suited as low growing plants that others, and hedging is no different. Buxus or Box hedging, Rosemary, Lavender. For privacy you may be looking for a evergreen or deciduous tall growing hedging plant. the Cherry Laurel and Portuguese Laurel are two Privet Yew and many of the Cypress varieties including the well known Cupressus Leylandii and Chamaecyparis Lawsonii or 'Lawson cypress' are all worth considering. Excellent hedges for narrow spaces do exist and we are all familiar with the pencil pines, however the upright box hedging is often overlooked, this is Buxus sempervirens 'Grahame Blandy', slow, but long lived and excellent in a confined space. Always buy a few extra plants when putting in a new hedge, these should be planted out in the garden and used to replace any that fail during the establishment period. Hedges with a northerly aspect can be a little difficult to keep dense and bushy as they they tend to reach for the light. Planting to screen your neighbour ? Be considerate, do not plant to close to their house, try not to block views or overshadow. Good fences may make good neighbours, however inappropriate hedges can cause a little friction.